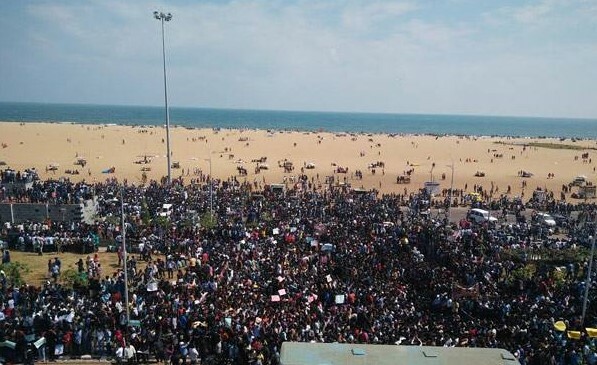 Tamilnadu Jallikattu Update: The students and youngsters from Chennai started a peaceful protest at Marina beach from Tuesday (17th Jan) night and today other district students and youngsters also joined in this peaceful protest stating Justice for Jallikattu. Finally, Chief Minister of Tamilnadu O PanneerSelvan responded to the protesters and he promised to meet Prime Minister of India Mr. Narendra Modi and take all the necessary steps to allow Jallikattu. Now cine actors, politicians also joined in the list to save Jallikattu as it is a very old culture and Tamil pride. Afternoon today, Madras High Court made an announcement that they don’t interfere in this protests. Moreover, these youngsters are real heroes today and ACTORS, POLITICIANS please stay away from stealing the show by appearing in those protest areas. This is the real power of true Tamil people and WORLDHAB team proudly waiting for a good result within a couple of days. Stay tuned for more updates regarding Jallikattu issue.